iPad 2 has brought hundreds of thousands of new users to the tablet community. Add that to the millions of smartphone users out there, and that’s a lot of people who want to share information. Unfortunately, what many can’t come to grips with is the lack of a practical keyboard. If you are filing reports from the field, or heaven forbid, trying to fill out a spreadsheet, there is nothing worse than a non-tactile, appearing and disappearing keyboard. Productivity is back, thanks to Freedom and their i-Connex keyboard. This is a foldable, but full size keyboard that connects with your device by Bluetooth. Once paired and connected, you can go right back to touch typing and quickly complete your project. Windows Mobile 6.1 and 6.5 (with built in HID support). Windows, Mac and linux based laptops, PC's, tablets and netbooks. 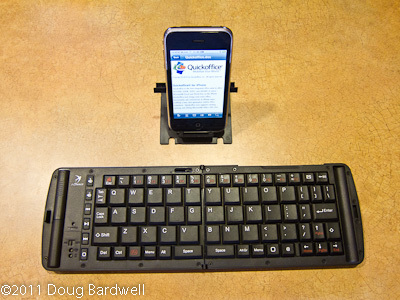 All other devices that have built in support for HID Bluetooth keyboards. A slide-out stand is concealed in the unit which gives you a place to rest your smartphone at a convenient viewing angle. When you are done, flip it back to the flat position and reinsert it back into the keyboard case for travel. It adds virtually no weight. Separate Alt and Ctrl keys allow you use your favorite keyboard shortcuts. Six separate keys perform multimedia controls like play, forward, reverse, volume up and down. A sliding lever locks the keyboard in the full open position so you can use it on your lap without the keyboard folding up during use. Separate up, down, left and right arrow keys. Full set of function keys F1 through F12 available. Comes with a protective case so it can be tossed into a purse or briefcase. It operates on AAA batteries and reportedly lasts 90 hours in use or 3,000 hours in standby mode. With the freedom from my laptop, I can now file stories from the road using just my iPhone. Even though I had that capability before, without a real keyboard, I could just not bear the thought of struggling with Apple’s flat keyboard. The idea of filing a 400-word story was not something I would have ever considered. With the i-Connex, it’s no problem. Now with products like Quickoffice and LogMeIn, there’s no excuse why you can’t be truly productive with your smartphone or tablet.